Triona felt relieved that Ronan’s expression grew less forbidding as she turned her attention back to the stronghold’s heavy gates being opened for their guests. She drew her fur-lined cloak more tightly around her in the crisp late afternoon air. The day she had so fervently prayed for had finally come! She could no longer contain her excitement and she rushed forward, though being so heavy with child made her gait more like the waddling of a goose. She could not believe how big she had grown and she still had several weeks to go before the birth of her and Ronan’s second child! Before Triona could answer, she felt the strength of Ronan’s arm around her waist. She glanced up at him gratefully, glad that he’d come to her side, too. In truth the preparations for their guests had exhausted her these past days, but she had wanted everything to be perfect for Maire and Duncan’s visit. Enough food for ten holiday feasts awaiting them. The O’Byrne men dressed in new tunics and trousers and the women resplendent in colorful gowns as befitted the special occasion. Aye, even the children and babes in arms had new clothes. Dozens of clanswomen had outdone themselves to make it so in three weeks’ time! Triona leaned against Ronan as the thundering of horses’ hooves grew louder. Her huge gray wolfhound Conn had appeared as well and bounded over to join them, plopping down at Triona’s feet. Ronan had only agreed to extend the invitation a month ago, though Duncan had sent a message back to Glenmalure a week later that he and Maire would be pleased to join them for Christmas. Thank goodness Aud and her jovial husband, Taig O’Nolan, chieftain of the Blackstairs O’Nolans, had arrived from Carlow to help with the preparations and to stay until after the babe was born. Niall and Nora had lent a hand as well, her kindhearted sister-in-law never far from Triona’s side. 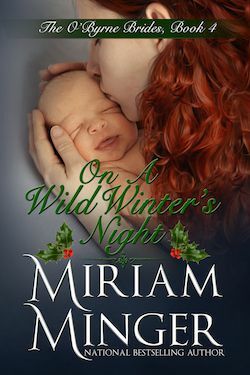 Niall had focused upon doing his best to soothe Ronan’s unease at having yielded to Triona’s fervent wish that the entire family, Irish and Norman, be together at Christmastime. Triona glanced over her shoulder to where Niall stood with his arm around Nora. The two of them made a loving and devoted pair if ever there was one, Niall so handsome and Nora with her thick auburn hair framing her face and looking radiant beside him. And no wonder she was radiant! Nora’s hand had drifted to her gently rounded stomach, aye, another O’Byrne babe, due to arrive in the spring. As Niall and Nora smiled with encouragement at her, Triona felt a strong kick inside her belly that made her gasp aloud. “Triona?” Ronan’s slate gray eyes were full of concern as he drew Triona closer. Ronan bent his head to tenderly kiss her cheek, both of them sharing the belief that this babe must be a boy for how vigorous his kicking and flailing. As the first riders in the entourage cleared the gates, Triona held Ronan’s gaze. Tenderly she reached up to sweep midnight hair from his forehead.